To sacrifice yourself through me. Congratulations to the students who participated in last years “Walktober”. 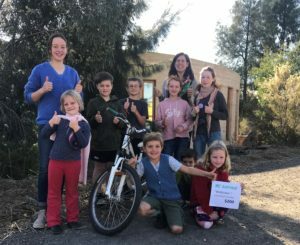 these children rode from town to school past Lisa Hall’s property. The ride is 5 kilometres long with some steep and rough sections. They certainly earned the $200 vouchers from Buffalo Sports. Well done all! And a big shout out to the two boys who are riding each day from Campbell’s Creek. Fantastic effort guys! The school continues to be in an “incubation” period for Whooping Cough. If there are no further cases this phase will conclude in Week 9. To date we have had 8 cases confirmed in total, in classes 5 & 2. The school has distributed the relevant links and fact sheets to help families identify the symptoms and seek GP advice at the earliest signs. 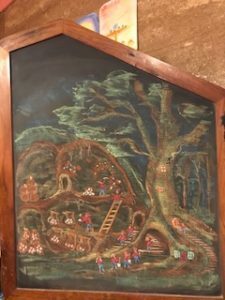 In the interim, everyone’s health and wellbeing can be supported by unwell children remaining home, supervision of thorough hand washing and encouraging children to cough into crooks of arms and not hands. Late Slips – Parents please be aware that if children are late to school they need to come by the office and collect a red late slip to take to their class. The office needs to collate who is and isn’t present each day for emergency purposes and the slip lets the teacher know that you have been via the office to do this. Policies – There has been some changes to the Admissions and Enrolment Policy for the school. Refer to our “Policies” page for all up to date policy information. There is a feeling of winter in the air. Autumn has been very delightful in Kinder, the children have been enjoying the beautiful coloured leaves in the playground. 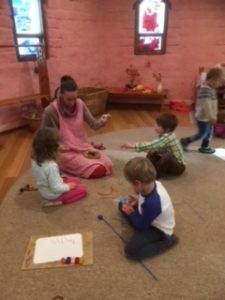 They have also been enjoying our ‘up the track’ morning circle. I look forward to sharing more of the circle songs with you at the upcoming festival. The cooler weather has turned many of us in Prep into busy little gnomes digging in the earth. We were all delighted to welcome Gianluca back from his wonderful adventures overseas. The children are loving learning their numbers and beginning to count in 2’s and 5’s. 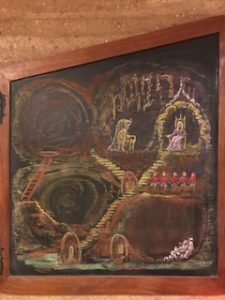 Everything is told through story and here are some of the beautiful chalkboard drawings that we have been learning from over the past few weeks. Please do everything possible to be on time each morning. 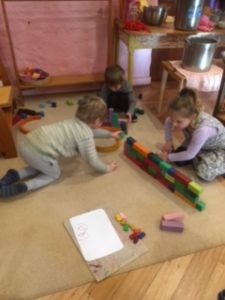 The children are learning so much and we are off and out on adventures early each morning. It is difficult to keep the rest of the class happy while we wait for any possible late comers. Being punctual is very important to little people and we don’t want anyone to miss out. Please send hearty lunches – We have a few children regularly complaining of being hungry and more so as the weather has gotten colder. Bigger lunches please! 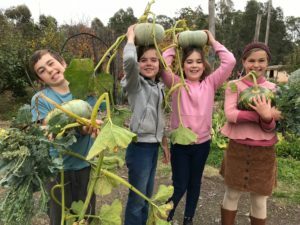 Gumboots – Can all children have a pair of gumboots to be kept at school for the wintery wet days ahead. 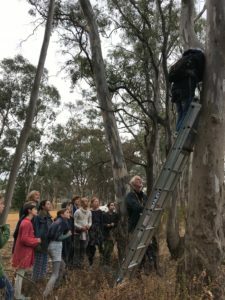 Inspecting nesting boxes on our recent camp. 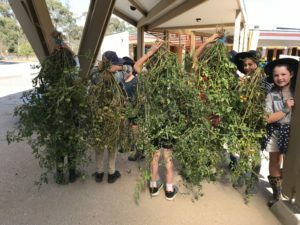 We are enjoying our Botany Main Lesson “The Wonderful World of Plants.” Each morning we have spent some time on a nature walk in the lovely Autumn crisp air. The children have been very busy observing fungi, algae, moss, lichen and conifers. 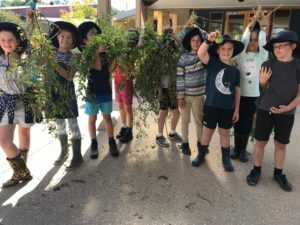 We have been focussing on our observation skills and the qualities of the plant and how they relate to the human being. 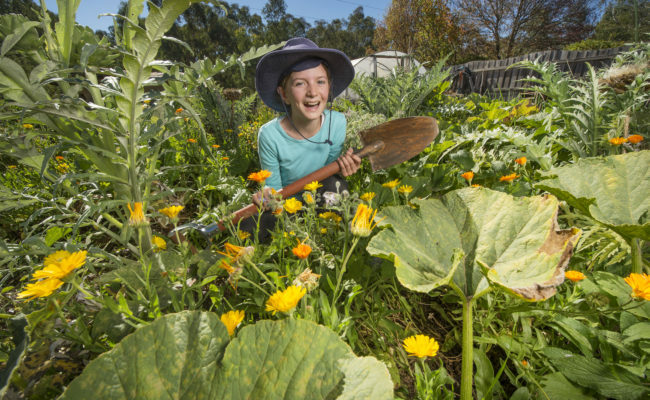 Next week we will have our excursion to the Castlemaine Botanical Gardens. Class 6 are having a lovely time finding out about Sedimentary, Igneous and Metamorphic rocks, creating them, painting with them and observing them in their local environment. ~ Business using used coffee grounds and turning them into beauty products and even toys…..
Greetings all. 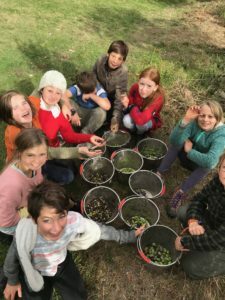 Class Six are wending their way from Wednesday to Friday this week along the Muckleford Gorge – a fault line created about 400 million years ago in this area. 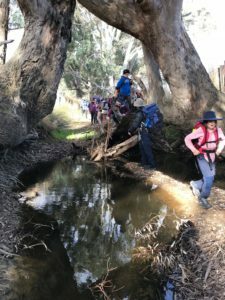 We will be following the Muckleford Creek until it reaches the Loddon River. 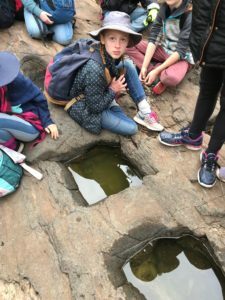 This is part of our new Main Lesson, Mineralogy, so we will be looking closely at the geology and rock structures on our walk and getting to know better, part of our local area that usually would not be accessible to us. We thank all the farmers who are generously allowing us to move through their farms. Now that the weather has turned, please make sure that warm clothing is worn to school each day. We are having a fascinating time exploring the Middle Ages for Main Lesson. We have begun working on our class play, and are also finding out about life in the Middle Ages through a research project. 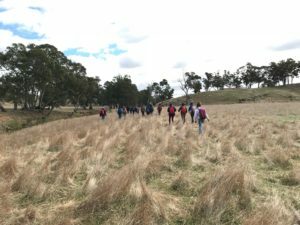 On Tuesday week we will begin our own pilgrimage; over four days we will walk from school to Mount Franklin along the Goldfield’s Track, setting up camp as we go. Thank you to everyone who came to our class meeting on Wednesday evening. It was lovely to see you. 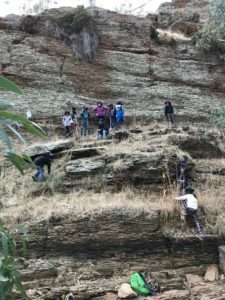 Class Eight students have returned from our Mt Arapiles rock climbing camp with lots of enthusiasm and plenty of interesting anecdotes about their experiences – which have formed the basis of personal writing responses that are a finishing touch for our Geology unit of work. Students are currently completing the Mini Project presentations that are a ‘dress rehearsal’ for their Major Projects in June, and we have seen some fascinating and beautifully presented projects so far. Along with cooking for our Class Meeting (a very delicious Leek and Potato soup!) we are also encountering the poetry of the Renaissance and Romantic era, beginning some foundation work on our Shakespeare play and looking at the causes of the American Revolution. Beyond Main Lesson, everyone is also working very productively in everything from Craft and P.E. to Drama and Spanish. A very busy term! Class Eight students would like to invite all other students – and any interested knitters! – to come to our Knitting Club sessions on Thursday lunchtimes in our classroom throughout the winter. While you are most welcome to bring any knitting project you are already working on, we are also looking for knitters who might make knitted squares to construct a rug, which we will then raffle at this year’s Spring Fair in November. We would once again like to donate the proceeds to Frontyard, ​a Melbourne based organisation which supports homeless youth. Their website (a part of the Melbourne City Mission website) can provide you with information about the services they offer to young homeless people. 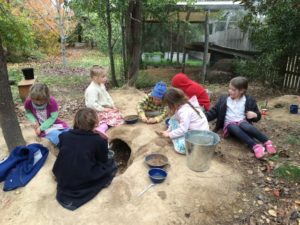 Castlemaine Steiner School and Kindergarten has been a past donor for Frontyard and we would like to continue that tradition. Knitting patterns for making a simple square are available at the Office or in Class Eight and we are currently collecting knitting needles (or BYO) and donated wool. Come and join us or drop off completed squares at the Office! French students in Classes Six, Seven and Eight are all busily working as we find ourselves approaching the half way mark of the term already! In Class Six, students have made a good start on a sequence of work which relates to their Main Lesson Astronomy theme and have also begun reading the famous French fable, ​Le Petit Prince. In both Class Seven and Eight we have been revising body parts and vocabulary for colour, as well as working on the various parts of speech so that we can construct simple sentences and stories. And along the way, students are completing regular weekly homework tasks to reinforce our classroom learning … and are brushing up on basic dictionary skills that are helpful in any language. From the Garden - it's harvest time! 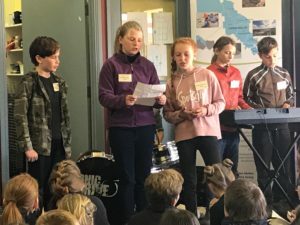 On Mother’s Day the “after school group” performed a popup concert at Das Kaffeehaus in front of a large Mother’s Day crowd. Ava and Amos from Class 7, along with ex students Ezra, Sascha, Lucy, Isabella, Ella and Daniel all performed a variety of pieces with great finesse and received many accolades. A big thank-you to their parents and Jeanette for their wonderful support and congratulations to the students for a sterling effort. Hi Everyone, I returned to work last week after some time taken out from regular life (6 weeks!) on our family Heritage Journey. Whilst we had an intense, at times exciting and enriching journey to Italy and Scotland, it is a relief to be home and back in the familiar rhythm of the school term routine. My work role continues supporting children, families and staff in various ways. A particularly interesting aspect of my role is in the area of gender affirmation. The school- and the community in general- are seeing increasing numbers of children and young people yearning for a more free expression of themselves- sometimes this extends to wanting to throw off the restrictions they experience within the gender norms of our culture. In response the school is developing a Gender Affirmation Policy, and I am meeting with Safe Schools Coalition next week to explore how to support families further. A community event for teachers, parents and carers. An informative full day featuring leading experts in the educational child safety space, sharing new information and practical strategies that can be implemented every day to create a safer online and offline world for children. 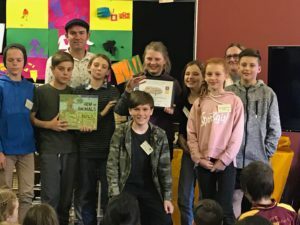 Castlemaine Theatre Company Presents - "As You Like It"
Rainbird Overpants – I have a pair of near new Rainbird waterproof overpants for sale. They are size 6-8 (58-60cm, probably good for an 7-8 year old).